Fittest on Campus is a high school competition dedicated to the sport of fitness. In 2012 the inaugural competition took place at Del Campo High School in Fair Oaks, California. With the help of Del Campo Faculty member Joe Ellis and fellow alumni and gym owners Blair Morrisson of CrossFit Anywhere and Clint Milusnic , a competition that started as a dream was underway. In the Spring of 2012 a competition that was announced only 2 weeks in advance gained the eyes of more than 35 competitors, both male and female. The competition was a game of fitness and a will to become a better person. 2 days of fitness oriented events in which the competitors were told the events only the day before the event. This means that no one could prepare for the event other than to train for the unknown. In the spirit of the CrossFit pmethodology athletes were put through a battery of movements that ranged from olympic lifting, to gymnastics, to endurance sports, and even into the pool for a swim. 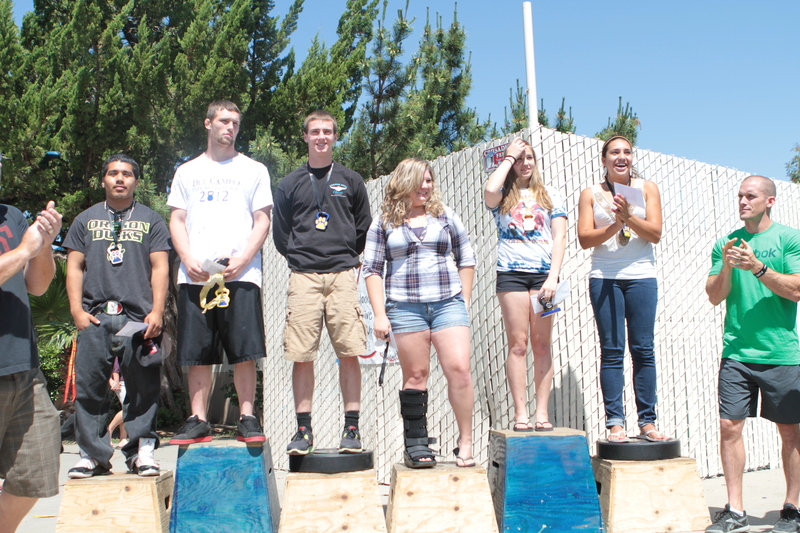 At the end of the 2 days the top 3 athletes both male and female were crowned Del Campo’s Fittest Students. Athletes received both a cash prize as well as gym memberships. The competition was a showing of human drive, campus community from a wide variety of interest groups. The spirit within this group travels outside the weightroom and has touched the lives of many. What other sport do some of the loudest cheers come for the person in last…..just to see them complete their goal. Where else do you see your competitor finish his/her event then come directly to you to encourage you to finish. This is what Fittest on Campus is all about. Del Campo’s Fittest is moving into its 5th year. The event will be held for the first time as a 1 day event. This year it will take place on Saturday May 7. The events will be taking place at the new and improved Cougar Canyon. This year we decided to release the movements a week in advance for practice reasons. The workouts will be announced 3 days before the events and the weights will be released upon arrival. Open Gym will be held for a week in advance to work on movements with a student trainer if one desires. It should be an exciting event Please check back for updates to the Blog as upcoming info will be added often. Del Campo’s Fittest is looking to expand. With enough interest we are looking to hold a District wide competition in the near future. This would consist of holding a school event for all involved and then taking the finalists to a centrally located facility for a District’s Fittest event. Winners to be crowned the Fittest Students in the District. If this takes off then we move to Nor Cal/So Cal. Lets keep this movement going and continue to build a healthier America. Our Children deserve it.